If you install a new TV system for your hotel or renew your agreement with DIRECTV prior to 12/31/18, you may be eligible to receive 54 channel COM3000 or DIRECTV Residential Experience (DRE) HD equipment at NO EXTRA COST* when you sign up for a 5 year agreement! For more than 54 channels there are additional fees. 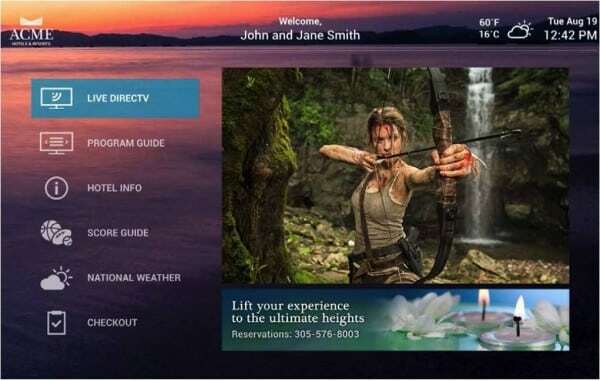 Learn about advances in TV System and Digital Signage technology from DIRECTV including the New Welcome Screen Pro for the DIRECTV Residential Experience and the Welcome Screen for the COM3000 Pro:Idiom Headend system. Learn how this industry leading technology can help you save money, promote your properties amenities and events, make your staff’s jobs easier, and provide a more entertaining TV experience for your guests. *COM OR DRE EQUIPMENT OFFER: Offer is available to new or renewing Hospitality and Institutions customers who activate within eligible dates (12/31/18). 5-year programming agreement required. Properties must subscribe to SELECT Package ($5.50/room/mo) or above, with local channels ($0.50/room/mo. ), if available in your market, HD Access ($0.75)/room/mo.) (requires HD in all units), qualifying premium channel service; requires 75-room minimum for COM3000 equipment; 50-room minimum for DRE equipment. A (DRE) System software receiver fee ($0.40/room/mo.) applies for DRE equipment. Add’l equipment and fees apply for upgrades. Installation charges apply, installation fee is based on hotel size. Applicable use tax adjustment may apply on retail value of installation. FOR ALL HD OFFERS, IN THE EVENT YOU FAIL TO MAINTAIN YOUR PROGRAMMING AGREEMENT, YOU AGREE TO PAY AN EARLY CANCELLATION FEE EQUAL TO THE FULL SUBSIDY AMOUNT PROVIDED TO YOU ON A PRO-RATA BASIS, REDUCED BY THE NUMBER OF MONTHS PAID DURING THE COMMITMENT PERIOD. Payment is due within thirty (30) days of receipt of a notice of failure to complete the commitment period.